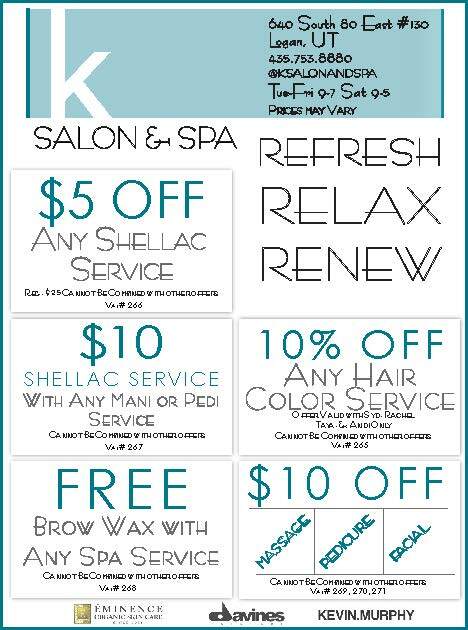 • $5 OFF Any Shellac Service (val#266) • $10 Shellac Service with Any Mani or Pedi Service (val#267) • FREE Brow Wax with Any Spa Service (val#268) • 10% OFF Any Hair Color Service (val#265) $10 OFF Your Service: Massage , Pedicure, or Facial (val#269,270,271) Offers cannot be combined. Some restrictions apply. Valid with specific stylists only. See salon for details.